MikasiWolf has been writing since 2007, though his first furry fiction work was only completed in 2010, which tells of the adventures of several apprentices on a journey. He first found the Furry Fandom in the Labyrinth of the Internet, and is interested in anthropomorphic people and creation myths that involve them (e.g. Coyote and Raven). 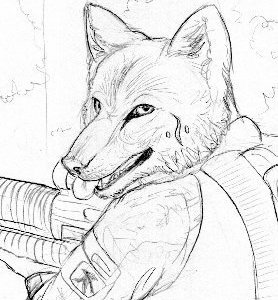 He had his first story selected for the Punked anthology by FurPlanet in 2013, and continuously ponders worlds in which anthropomorphics would play a major role. He is honoured to have been part of The Furry Future, in which humans have the option to become anthros to better serve society. MikasiWolf currently lives in his den in Singapore with his dog Milo, and enjoys talking about writing and art, the latter of which is now seconded to wordcraft. Feel free to drop him a note with any questions you might have! He hasn’t bitten. Yet. For more information, please visit MikasiWolf at http://www.furaffinity.net/user/mikasiwolf/.